400 cows trample misfortune out of worshippers in India | We Seek the Truth! 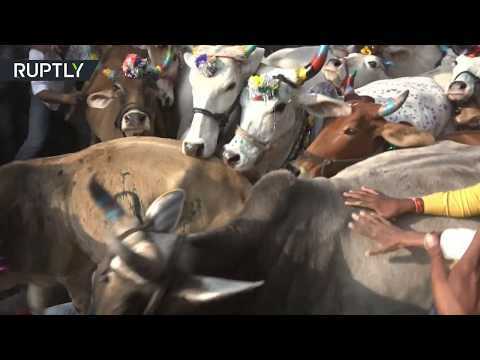 Scores of men were voluntarily trampled by cows and bulls in the village of Bhidawad in India’s Ujjain District on Thursday. It was part of a ritual in order to cleanse them of their troubles and bless them with prosperity. The age-old tradition followed by Hindi men takes place on the day after Diwali, the festival of lights. Despite the possible dangers, hundreds travel to the city to lie down on the ground as the sacred animals are let loose. The Kurgan ~ Built By A Prediluvian Civilisation?